You’ve asked so I’ve obliged and today I’m sharing pictures of our little house! If you haven’t read the series yet you might want to catch up on our Fulltime RV Living Journey so far first. 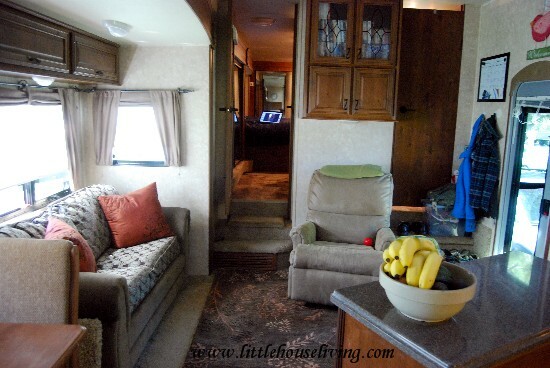 We put a lot of thought into the rv we wanted to buy before making our big purchase. We chose to go with the rv that had everything we wanted and needed since we are unsure of how long we will be living here and we wanted a comfortable home that we wouldn’t get sick of quickly! Our home seems to fit us perfectly so far and we are very glad we didn’t compromise in our decision. A different view of the bedroom. We have a little shelf above the bed that I put a few Willow Tree figurines on. You can also see the hallway in the picture with another mirrored closet. This closet holds my husbands hanging clothes and our washer/dryer and laundry hamper. In that hallway is also the main bathroom. Oh exciting…a picture of a bathroom! LOL. Pretty basic. Sink, shower, full size tub (that was a must have for us with a baby!). Not much for storage in here so I have a few plastic containers with some things stacked. The sink looks pretty but I’m not a fan of cleaning it! The best part! My kitchen. I really love everything about this kitchen. The island is movable and I like it crooked like that to have maximum usage. I have a double fridge which I’ve never seen in a camper until we found this one, but let me tell you, when you order your food once a month it’s awesome! I have my Berkey set up next to the sink so we always have fresh clean water. The door you can see in this picture leads into the second room. The other side of the kitchen/living room area. We have a real wooden table instead of a dinette with cushions and it even has 2 leaves to sit more people. The couch folds out if we would ever need to sleep someone staying over. 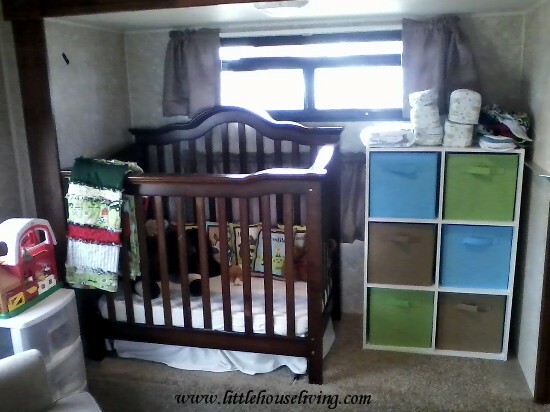 In the back is the second bedroom, the baby’s room. The room actually has a large loft area where we store extra blankets, bulk foods, and some other things. There is a bathroom and closet in this room (behind that chair) but we don’t use them, just for storage so they don’t need to be accessible. The chair used to be in the corner where I put the little white table and chair. It makes more sense to have something useful! The other half of the room. This used to be a couch and a bunk bed. We took them both out to install the crib and dresser. On top the dresser is my diaper station. There isn’t much going on outside since we are parked at a campground for the time being but I though I’d shoot a few pictures anyways! This is our pad. It also has a picnic table. I found the big rug at Walmart (water can go right through so I don’t have to dry it when it gets wet!). 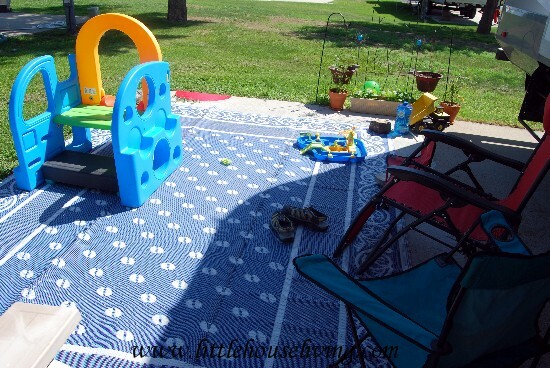 We have 2 chairs and a few toys for our loves-to-be-outside baby. We are within walking distance of playgrounds. My tiny garden is in the back of our pad. 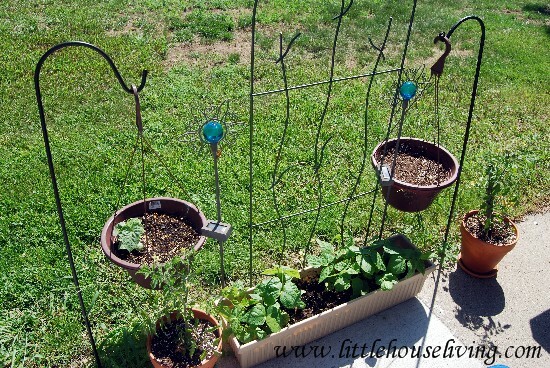 I have a container of beans and a trellis for when they get larger (they are pole beans). I have only one lone cucumber plant hanging up since my other one drowned (need to find something else to put in there!). And then 2 tomato plants on the sides (grape tomatoes). I put some little solar light flowers out there for fun. I will be dependent this year on produce from friends and family and the farmer’s market. It will be different but I’m ready for the challenge! What a nice home, thank you for sharing it with us. LOVE your kitchen! We rented an rv at a campground a few weeks ago and loved it. That kitchen is something else! Love it! Wow! Everything looks super pretty and nice. I could never afford such accommodations but am sick of “city” living and was trying to find some kind of best-solution alternative. This set up looks to be just as expensive as a conventional home. All I can say is, Wow! WOW! WOWeeeeee! Thanks for sharing..this way of living is what I would truly love to do. Simplicity. Merissa ~ for the gardening, check out verticalveg.org.uk they have wonderful vertical gardening ideas going on there! Merissa! 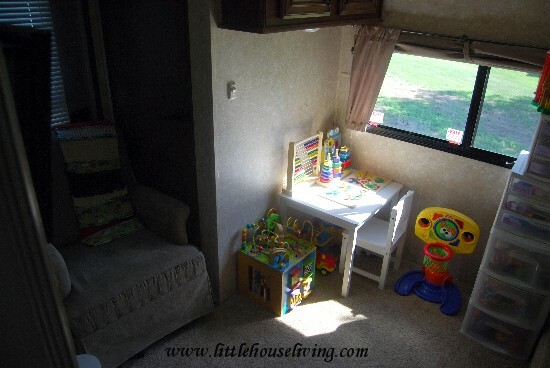 You have done a lovely job making this RV feel like a home! It’s so well thought out and beautiful. I love it! It’s beautiful, functional, and has everything a person would need! Awesome! What kind of rv? Wow! It is amazing what you did with this place! I am in awe!! I would love to live in your RV fulltime as well. Very smart placement of items. A very lovely RV, Merissa!! It has everything you need. You have decorated it so well. Your patio is adorable too. I hope you 3 have a wonderful time living there as long as you need to. I love this! You have done such a great job maximizing space. I’m not gonna lie part of me is a little bit jealous cause I love the idea of living minimally. Not having a garden would be hard though!! Thanks for the tour. We lived in our airstream for a year. Frankly, you get used to the space. Your RV is very nice and has all the comforts of home. Just think of it as a studio apartment! Funny, because I was just looking at studio apartments but thought it would be like living in an RV. Love the Willow Tree figurines in the bedroom! Love it–the fridge is nice!! But as for our family of 9, I don’t think our 12′ kitchen table and 6 beds plus crib would fit in 400sf!! Ha!ha! I was thinking the same thing. We are a family of 9 too and I was trying to imagine us all in that space even with just the basics. I do love the simplicity though and you’ve done a beautiful job with it Merissa! Thanks for sharing your ideas. They are inspirational even to those of us who can’t fit into 400 sf. Yes I would love to know what the make and model is as well!! We are getting ready to be full time RV’ers! 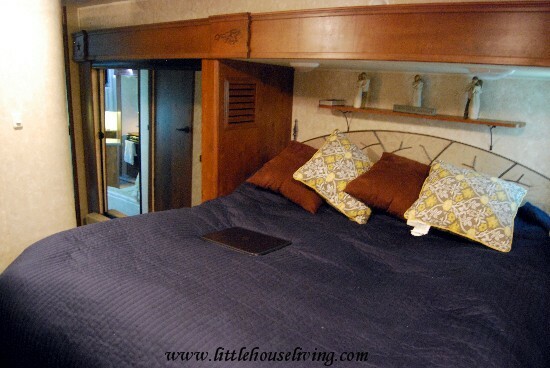 i had no idea an RV could be so much like a house inside. this is so impressive! thanks for sharing. THANKS FOR SHARING HAVE BEEN FOLLOWING YOUR STORY AND YOU HAVE MADE A LOVELY HOME I AM A BIT JEALOUS LOL WOULD LOVE TO LIVE LIKE THAT GOD BLESS YOU AN YOUR LITTLE FAMILY. I love your RV! We just started living full time in a RV too. We are loving it! It is easier when your kids are small and all 3 of mine are under 5, so they think it is cool 🙂 What kind of RV do you have? Thank you so much for sharing. I would love to live the way you are. The simplicity is so inviting and uncomplicated. For now I’ll have to settle for living vicariously through you. 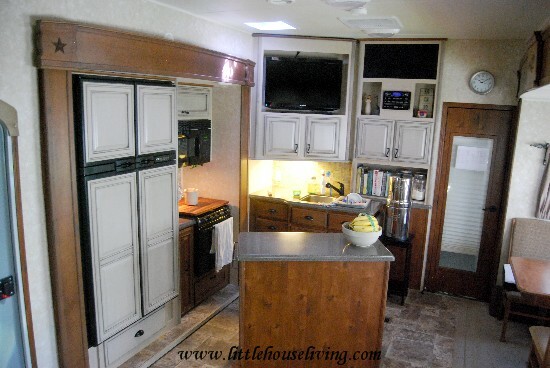 You’ve done a wonderful job in transforming your RV into a lovely home. I love absolutely everything about your house! You did the miraculous. =-) I have SO enjoyed your RV posts. What a great well thought out floor plan. I always felt that I needed more outdoor space than indoor space. I am finding with my own home, that I tend to “fill” that extra space I may have with knick knacks that I may or may not use. But if I had the space outdoors, the endless possibilities. Just stumbled onto your website. Your little home is lovely. How I long to have your simplicity!! We have a huge home and although I would miss having my chickens and goats, I would trade for a tiny home in a SECOND! Life just seems less complicated in a smaller space. Great job. Merissa, that’s a great accomplishment! The hubby and I have talked numerous times about doing something like this and living on a huge amount of property while we build our home. We just haven’t got the nerve up to downsize yet. Our two younger kids are 12 and 10 and we’re not sure how that would work out for us. But your posts are very inspiring! It’s definitely a leap of faith but we’ve found that we are SO happy we just dove in and made that leap, we know it will be best for us in the long run! I live very close to the RV capital of the world (where most RV’s are manufactured) Elkhart Indiana…….what make is your RV ?? This living option is very high on the consideration list for my hubs and I, so I have been anxiously awaiting your updates! Moved to Texas a year ago and rentals in the city we are in are so expensive, makes it challenging to save up for a home. We have been concentrating on the same type of option in a trailer. Taking this next year to make our decision, so keep those updates coming! Love the white cabinets, too, very cottage-y. I so like your home. We significantly downsized almost two years ago and I still continue to rid myself of clutter. After viewing your home I know I have more work ahead of me. Congratulations on being wise. It looks so nice Merissa! You and your husband have done a wonderful job organizing everything, and choosing furniture. 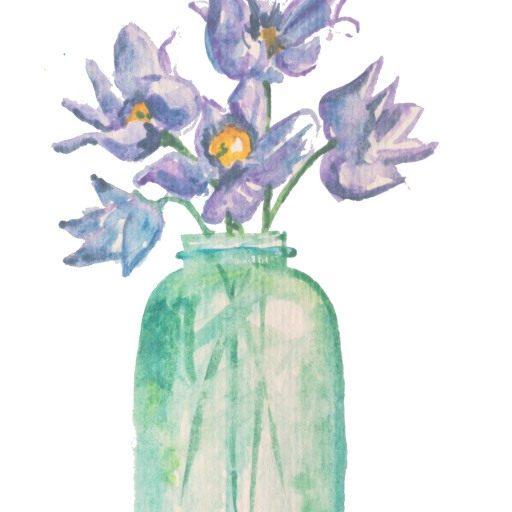 I also believe in carefully chosen and arranged trinkets and artwork. It is important when living in a small space to make sure it feels like home – we did the same thing! This is really nice! I never thought such a small place could look so homey and organized. Great work! Beautiful! 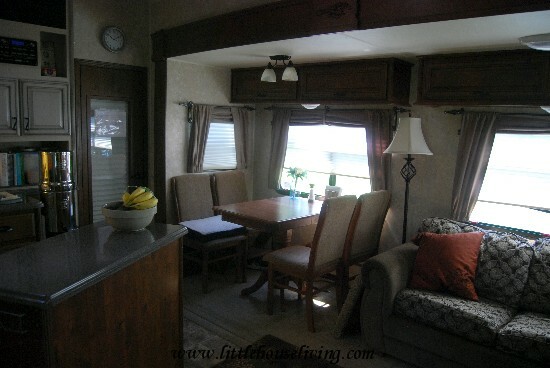 I had to keep reminding myself that it was actually an RV since it looks so much like a house! I hope you have an amazing time with your portable home!! this is really nice, especially the kitchen. I am so envious – in a good way. Thank you for all of the pictures. You have made an absolutely beautiful home in a small space. It was nice to see your outdoor space too. Good to know your opinion about cleaning that type of bathroom sink too. It is beautiful but it does seem like it would be more of a challenge to clean (and would probably need to be cleaned more often). We have been thinking of moving from the state we are in and until my husband gets approved for disability we wont have any money to move. If we did this things would be much easier! We have had our stuff in storage for 2 years and it is killing me to waste that money but we were holding out cause we thought we would be getting our own place soon but we won’t need furniture if we go to RV living. I am so excited now! Thank you! What is “the” Berkey you refer to in your kitchen? How does it work? Here’s a little more about Berkey Water Filter Systems. You are very inspiring! Thank you for sharing your story and successes for us to see. Wow! that is a mansion compared to what i am living in. a 22 ft. motorhome. For one person it works, but i need your organization skills. Drives me nuts sometimes how crowded i feel. I am living this way out of necessity and health reasons. I have done it now since June but the weather is getting colder and i need to come up with a winter stradegy as it might still be another month or two in the motorhome. 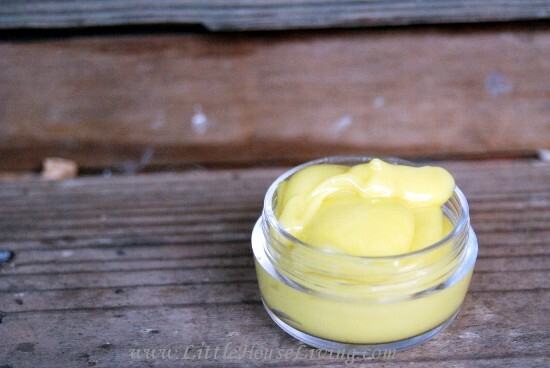 I like your site and your helpful tips! Is their more on how to winterize while living in cold climate. i am a montana boy. Beautifully set up. great to do this when the kids are young. I love, love, LOVE your RV! I wonder if you could take out the 2nd bathroom altogether and enlarge the baby’s room? I am in love with your kitchen!!! I’ve had plenty of small apartments where the kitchen wasn’t nearly as nice and spacious looking! What is the make and model of your RV? We have an Open Range 413 RLL. please im looking 4 long term travel that is it. I saw that you said you order your food once a month. Where do you order from and do they deliver it straight to you r do you have to pick it up somewhere? What about the water you use for the shower, laundry, and toilet? Do you filter that as well? If you are not at a campground how do you handle the toilet? I have never stayed in a RV, but am thinking about doing this. Thanks!! I order from Azure Standard, we pick it up at a designated drop sit in a nearby town. We have a whole camper filter so all the water is somewhat filtered, I only cook and drink the water from our Berkey though. And since we don’t have sewer hookups here with have a portable “Mr Buddy” manual sewer draining tank. Merissa my family and I are about to embark on a very similar journey. ..with three kids and a dog. I desperately need to find us an rv home. Where did you find yours? What brand/model is it? Thanks for any help you can offer. Hi Samantha, our rv is an Open Range 413RLL. We searched locally but then search nationally to find the very best deal possible and actually ended up buying ours from Michigan and the rv dealer we bought it from shipped it for free. It’s worth spending some time searching for a good deal! HI We are planning to ft rv sometime in the future and I love your layout, can you tell me the year and model of your rv. you have it fixed up so nice and homey too. LOVE it!!! Love it and the white cupboards too… I showed hubby and he said where is the tv. and lol didn’t see in pics had to go back to the layout look then we found it. Enjoy your time and I know it will bring you many happy memories! I’ve been searching online for decorating ideas for fifth wheels & came across yours. I love the way you’ve made it a home. My husband & I are saving to retire & live in an rv full time. Yours has inspired me! Thanks for sharing! In what type of place do you have this parked? For me that seems like a big issue. Could u talk about what you have learned from searching out places to “dock”? Matthew, you will want to check out the entire RV Living series I have posted here. We started at a campground, moved to someone else’s land, and then finally onto our own land. There are many places to park an rv, it just depends on your situation, your rig, and where you want to be. My husband and I have lived this way for almost six years. It’s amazing how comfortably we live in such close quarters. We have taken out all the “built ins” and replaced with regular sofa, chair, side tables, baby chest of drawers (for storage), and also an area rug. I’m quite a container gardener now, growing tomatoes, lettuce, onions, herbs and of course, flowers/shrubs. I hope someday I can get out of my RV and live in a real home, but for now, it’s for the best. I have been unemployed for about 7 months – this makes living with a one person income – doable. Hi there! My husband and I just purchased our RV to be lived in full time! We have a 6 month old and are eager to learn how to make this work for us. 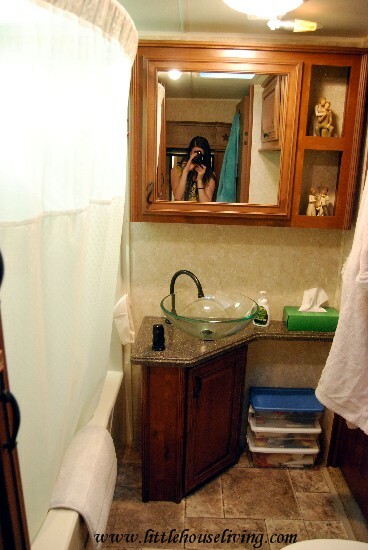 Our RV is without a tub, however so that’s a big bummer, but super awesome that you have one! Any suggestions on how to bathe him without a tub? Also curious where you do diaper changes, I’m so used to my changing table, so that will be an adjustment! Also, WHERE do you get an adorable mini crib? Awesome! Im looking for a the model of your home? Im searching and searching for something to suit our family of 3 and it’s really hard! They seem to be catering to retired people…..
Could you tell me your the model? thanks!! I LOVE this post! My husband, nearly 7 year old son, and I are currently living in one small bedroom in my parent’s house as we wait for our missions funds to come together. After the tight quarters and no longer being tied down by a house or debt we have been thinking about doing this. It would feel huge after living here. I can’t wait to read through all your posts with my husband as we think through this decision and maybe implementing it in about a year and a half (after our mission trip of 15 months). Nice blog! It was not clear to me if your small home was motorized or not . There was no photo of the exterior. How many feet is it in length? if it is a trailer/caravan, how powerful a truck do you need to pull it? Can one keep warm in one in ice cold temperatures? It was a 5th wheel camper so we needed to pull it with a truck. This particular camper required a one ton truck, all campers are different though and may need a different vehicle. It was 39 feet long. We kept it warm inside in -30 degree temps but it did go through propane very quickly, especially when the wind was blowing. We are full timers and just found out we are expecting! What model is your 5th wheel it looks absolutely perfect. We will need to upgrade as of now we only have one room. Our rv was an Open Range 413RLL. Congratulations! Very nice HOME!!! I noticed your comment about the floors being cold. I recently redone the floors in our camper at our hunting camp using the paper bag method. It really helped seal things up. We are just wondering what brand and model your trailer is? This was a 2012 Open Range 413 RLL. Don’t you just love the Open Range? We live full time in a 398RLS, as we have for the past 4 ish years and love it. Yes space is challenging, but most people, if they are honest, learn that it isn’t about having too little space, it is about having too much stuff. You’ve done a great job finding space. Have you used the space under the head of the bed yet? We but extra hinges in to access that area. Yes we did that in ours too, there was so much space up there! Just curious as to what kind of RV you guys have? It’s Beautiful and I love that it has a king sized bed! My husband and I will be chasing our careers and moving into an RV within the next 3 weeks. We had an Open Range 413 RLL. You are such an encouragement! I stumbled stumbled upon your blog via Pinterest but I will definitely be coming back. Thank you for sharing your family’s journey, and your recipes, and everything! What ruck do you use to tow? Why did you decide to buy a 5th wheel vs motorhome? We had a Chevy 1 ton Dually truck. At the time we had this camper we did not want to have a tow vehicle and wanted maximum living space. The rv that we used to own in the pictures above was an Open Range 413RLL. What kind of RV do you have? Brand, floor plan, etc???? We just made the jump from a huge 3000sqft home to a 38ft camper O_O we picked ours up cheap and are “glamping” it out now 😀 big move is on the 28 th! They were moved and taken down every time we traveled. You have done such a great job maximizing space! and organizing! 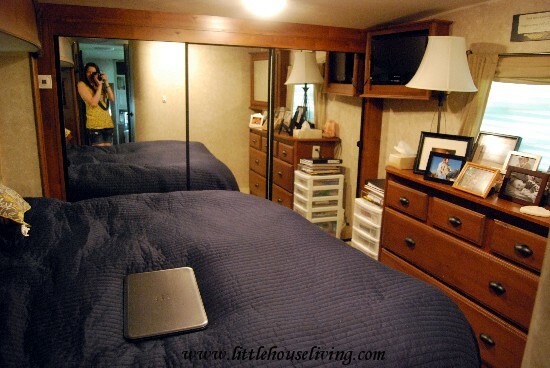 How many square feet is the master bedroom?” and what is the rug from walmart? would love to have one like it! I believe the master bedroom was around 100sq feet? I couldn’t find the rug on Walmart’s website anymore but here’s the same thing on Amazon: Reversible Rug. Absolutely love it!! So pretty and cozy and you all rocked the utilization of space! Thank you so much for sharing this with us!! We’re picking ours up this weekend. Same make and model as yours in a 2011. We’re super excited. We’re a full timing homeschool family and this space is going to be so much better than the smaller RV we’re currently in. Thanks for sharing pics! It totally gives me ideas on how to utilize my space. ?